It was another moment to saviour as Arsenal legend Thierry Henry sealed all three points for the gunners with another fairytale goal, this time in stoppage time. In what is Henry’s last Premier League game for the gunners, he certainly gave the Arsenal fans a great farewell gift and if anything has improved his already legendary status. 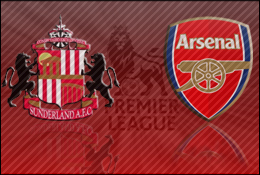 While it ended well for the gunners, things looked to turn out disastrous with German Per Mertesacker gifting Sunderland the lead after going down to injury close to our penalty area and allowing McClean to pounce on the lose ball. The win some will say is a deserved outcome after Arsenal dominated possession and looked largely untroubled at the back, although in saying this Sunderland played superb tactically as they effectively nullified Arsenal’s traditional slick passing play by playing a very tight formation at the back. Luckily for us Gibbs has come back from injury meaning Vermaelen will be likely to move back into the centre of defence and pair up with Koscielny who has been in the form his life this season. The pairing is considered Arsenal’s first choice centre-back pairing and is a welcome change as the back-end of the season approaches. Plaudits must go to Arsene Wenger’s substitutes as all three players had a hand in Arsenal’s fightback and eventual victory. Aaron Ramsey finally curbed the norm and tried a shot from distance which went in off the post and Andrey Arshavin played pin-point ball for Thierry Henry to prod in the back of the net from close range. No doubt Wenger will exert a wry smile after Arshavin again came up with some goods after featuring for a small time on the pitch. We now look forward to the upcoming Champions League clash against AC Milan in what will be a very tough match away from home for the gunners! He finished the story of the legend today in the championship; I hope he will add some in the Champions League on Wednesday now. Certainly he got us the three points in a difficult game where Sunderland were resilient, well organised and tried to catch us on the break every time. You could see that they have a lot of spirit in their side. It was also on a very difficult pitch. We had a lot of the ball but we couldn’t create a lot because our passing was good but it was very difficult to get into their defence. On top of that we were 1-0 down so it was a question of a spirited performance and that is what happened in the end. I felt we were intelligent, patient and resilient. It was unfortunate. Mertesacker told me that he got a shot in his ankle and couldn’t move at all anymore. We are a bit worried about his ankle I must say because he goes home on crutches. He has done some ligament damage, but how big that is we will have to check tomorrow. For sure he is out for Wednesday. I thought about it during the game after they scored but you cannot demand that. You do not know if a guy has gone down through injury or because he slipped. It’s just that in the action you cannot demand to stop. It might haunt me again because then people will say ‘why did he not stay?’ It just shows you as well that these players never lose it. Exceptional talent survives. You have that with Giggs and Scholes at Manchester United and Thierry here. It is just a luxury to have a player like him on the bench. We will see next season, but maybe he might want to stop at some stage as well! Two weeks ago everybody said it was out of reach for us and today we are in it. So we have to be cautious. But we are happy to be back in this position but it is still very open for everybody around there. You have Newcastle, Chelsea, Liverpool, us and it’s down to consistency now. Wojciech Szczesny | 7.0: Unfortunate to concede from McClean’s fortunate chance, but did very well to deny Gardner’s efforts from just outside the box. Bacary Sagne | 7.0: Solid. Looked sharp all match and was full of running as well as looking very comfortable in the right-back position. A welcome return at this stage of the season. Per Mertesacker | 4.0: While he looked strong in the air and was relatively untroubled, the big German was extremely lucky to not concede a penalty kick after handling the ball in the area and was also at fault for McClean’s goal after he went down injured and allowed the Irishman to pounce. Laurent Koscielny | 7.0: Arsenal’s number one defender this season produced yet another solid performance and looks ever reliable in the centre-back position. Thomas Vermalen | 6.0: Completely solid on defence, although perhaps should have gotten forward more considering how deep Sunderland were sitting in their own half. Alexandre Song | 7.5: He often goes unnoticed but the Cameroon midfielder was rock solid in the holding midfield role and also provided great link-up play to our attackers. Mikel Arteta | 6.5: While he was unable to produce the killer ball, the Spaniard did well to keep game ticking over and made some necessary fouls and tackles on defence. Tomas Rosicky | 6.5: There is no doubt Rosicky has the ability to glide passed defenders at will, but often lacked the final product. Perhaps should have taken some shots on goal after getting into great positions with his great technical skills. Theo Walcott | 6.0: Often had a poor first touch or was unable to break-away down the right wing despite having lots of ball. Robin van Persie | 6.5: Had a few chances to give Arsenal the lead, but wasn’t as influential as he usually is. Good to see the boys can go on to win a match without significant input from the Dutchman. Thierry Henry | 7.0: What can you say!? The Arsenal legend did it again with a timely goal in stoppage time! Aaron Ramsey | 7.0: Finally did what Arsenal perhaps should have done a bit more of in this match and that was shoot from distance. Great long-range goal that gave Mignolet no chance. Andrey Arshavin | 7.0: The Russian looked lively when he came on and delivered a couple of good crosses that got to Arsenal heads. Great assist for Henry’s late winner!